I wanted to follow up yesterday’s winter bike tire post with some common questions–and answers—about studded bike tires. 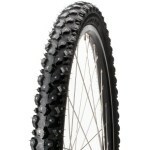 How much grip do studded bike tires provide? A lot. It’s remarkable how much traction they provide on ice or snow. But it’s not equivalent to riding on pavement. If you slam on the brakes or make a sharp turn at speed, your tires will still slide on the ice or snow. When riding in winter, it’s important to maintain a bigger safety cushion around you to minimize situations that require rapid acceleration or braking. Do the studs significantly increase rolling resistance?Yes, though it depends markedly on the number of studs. I currently have a pair of 240-stud Nokian tires (pictured) mounted on my mountain bike for all-purpose, go-anywhere winter conditions. They ride noticeably slower on pavement and often require me to downshift one or even two gears relative to what I would use with unstudded tires. If you’re riding through snow, rolling resistance is amplified further. Expect a good workout! Is it OK to ride studs on pavement?Yes, but it’s worth keeping to a minimum. Pavement will not damage studs. (The studs actually damage the pavement, leaving noticeable scrapes if you skid your tire.) But pavement does wear away the rubber treads. As the rubber around the studs diminishes, they can come loose and fall out–shortening the life of your tire. How effective are studded tires in fresh snow?In my experience, they work well in up to 2 inches of fresh snow. When depths hit 2 to 4 inches, riding becomes squirrely and your tires will slide around, especially if you’re riding a thinner tire. Above 4 inches, cycling becomes arduous to extremely difficult. Above 6 inches, forget it. Studs work best on ice and hard-packed snow. Who is Nokian Tyres?Studded bike tires are a funny niche industry that’s dominated by a Finnish tire company, Nokian Tyres. They mostly manufacture heavy-duty tires for vehicles and industrial uses in all seasons, but use their well-honed stud technology for winter bike tires as well. Apparently it’s a very small sideline operation—their bike tires (er, tyres) aren’t even listed on the Nokian website. For more, read my recent AMC Outdoors Equipped article, Ride On! How to Bike Through Winter).